The lovely Gwen Bell has issued a challenge about a challenge: write about something that challenged you this year and how you overcame it and why it was a good challenge. I'm doing it any minute. I don't like to think about challenges. I just want them to go away tra la. I am lazy like that. I don't know if I have overcome this one yet or not. Ok, I haven't. It is my continuing challenge, one that I deal with every single day. I am challenged by not having my parents' precipitous decline into old age taint my world view. The pain and suffering and helplessness they face every day as their bodies and minds wear our are almost more than I can bear at times. Their existential crisis has become my existential crisis. What's it all about, Alfie? I try to keep my eyes wide open. To be helpful and kind and to not minimize or ignore their suffering because I hate seeing it so much. Sometimes I pass and on many days I fail. I forget that they aren't who they used to be. I snap at them, I'm sarcastic, I'm impatient, I run out of there just to get away for a while. The temptation is to put up a wall - not against them so much but against feeling what is happening to them and letting the full horror wash over me. Because it is horrifying, it is scary, it is painful. It is only when I can gather my inner strength, my hidden Toltec warrior, and just be there that it is all ok. If I can just breathe through it, remember to be right there, right then - that's when I can feel all the feelings and let the power of love tie us together instead of let the misunderstandings, pains and fear tear us apart. So. That's not the most cheerful challenge on earth, but there it is. There is no tidy ending, no Oprah-episode "Aha" moment. Just life. I hope that's enough. Those big pointy colorful things on poinsettias are not the flower. Those are bracts. The flower is that weird little thing in the middle. 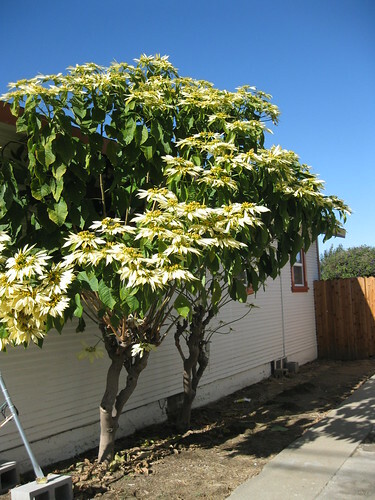 If you want a long-lasting poinsettia, pick one where there is no yellow pollen showing on the flower. 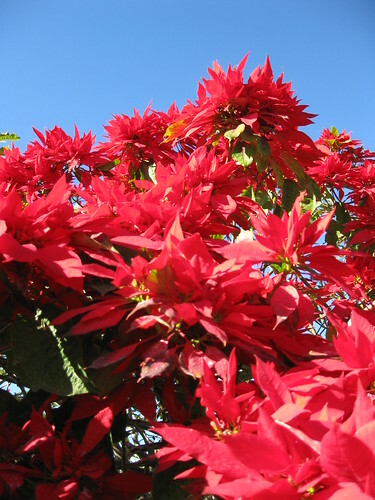 Poinsettias are from the genus Euphorbia. There are some very weird-looking Euphorbias. This may be why the Poinsettia's botanic name is Euphoribia pulcherrima, pulcherrima having the same root as "pulchritude" or beauty. Many people think that Poinsettias are toxic, but you would probably have to eat a giant Poinsettia salad to make yourself sick. The sap of Euphorbias is known to be irritating to the skin, though, so wash thoroughly if you get the sap on yourself. And just to be safe, do not eat the leaves. 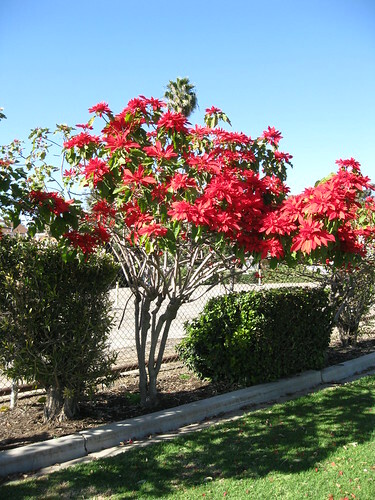 The world's biggest grower and breeder of Poinsettias is Paul Ecke Ranch in Encinitas, California. 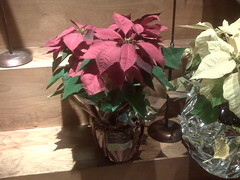 They are responsible for all those cool curly, spotty and multicolored Poinsettias that come out each year. Poinsettias are one of the most difficult holiday plants to grow. They need to be tricked into blooming precisely at Christmastime, which means providing them with exactly the right day length. Growers cover the little plants with blackout cloth or give them extra light at night to make them think the nights are just the right length for them to set flowers. I was a horticulture major in college. Does it show? Enjoy your holiday season. And buy some Poinsettias. My friends Spike, Lucky Spud and Doodle went to Vegas on an ill-fated trip and had so many bad things happen that they finally started a bulleted list, just so they could remember them all, lest they leave anything out of the tale of woe. Ok, it wasn't ALL bad. Mom made a good recovery. They caught it just in time. My sis PK came far to rescue us when I was freaking out because the angioplasty fell on my last day at work and I needed to go clean out my cubicle and say goodbye. She really, really saved the day. A nice hospital employee named Devin very kindly walked me and my lost dad around the hospital when we couldn't find mom, and his sweet gesture swept the rest of the staff's cluelessness and rudeness right away. Mom promised to go back on her heart meds. Tell me about the FUN thing you did this week.